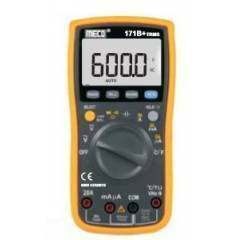 We are a leading Wholesale Trader of digital multimeter meco meter, digital multimeter, motwane digital multimeter dm 4750d, meco trms multimeter 81 usb, motwane digital multi meter dm 3540 a and meco digital multi meters 18 trms from Mumbai, India. 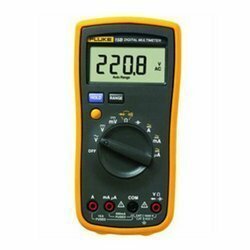 By keeping in mind the varied specifications of our respected clients spread all over the country, we are providing Digital Multimeter Meco Meter. 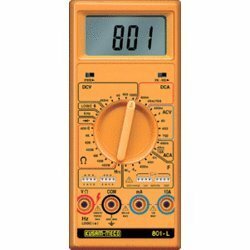 Our multimeter measures resistance, voltage and current in electronic circuits. 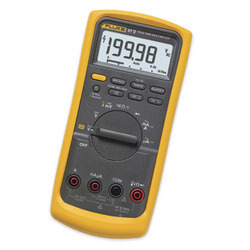 This multimeter is appreciated by our clients due to its optimum quality and durability. 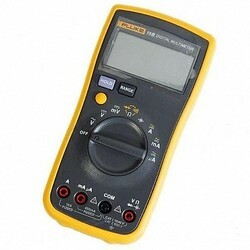 The multimeter offered by us is designed by using top quality of material & leading techniques in accordance with the set norms. Polarity Automatic, (-) negative polarity indication. Over range Indication Highest digit of 1’ or ‘-1’ is displayed. Power Single, Standard 9V battery. Measurement Rate 3 measurements per second, nominal. Test Leads, Spare fuse 0.8A/250V, battery. Carrying Case, User Manual. Protection Category: CAT IV 600V. The dual display included a main display and a sub display. 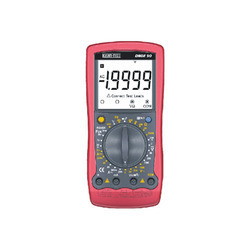 Main display always display current measurement value where as sub display shows some special measurements like maximum/ minimum value, reference value for relative value measurement. Also dual display is used to display at the same time Voltage/ Current with Frequency, Frequency with Duty cycle etc. In AUTO ranging mode the instrument automatically selects the range with best resolution depending on the applied input. In manual ranging mode range is user selectable using AUTO/MAN Key. 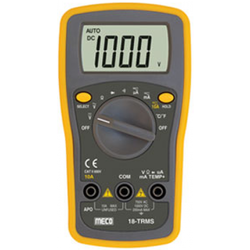 Note: For AAC, ADC, Temperature ,Continuity ,Diode and Duty cycle measuring range is manual. No AUTO range selection is possible. Hz/Duty By pressing “Hz/%” key in Vac mode the instrument can measure frequency (Hz) and duty cycle (%) of the AC Voltage by pressing. 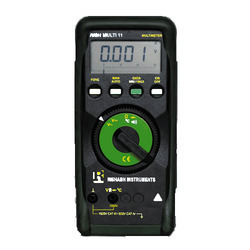 RISHABH 410 digital multimeter is suited for universal, general applications in the electrical and electronics fields for training and education. It is a compact design, that fits into pocket. The protective cover, which is provided as standard equipment, can be opened at an angle for convenient reading on the work bench. The measurement functions are chosen with the rotary selector switch.The measuring range is automatically adjusted to the measurement value. The measuring range can also be manually selected with the AUTO/MAN button. Note : For Temperature ( 0C ) , Frequency ( Hz ) , Duty cycle ( % ), and Capacitance ( F ) measuring range is AUTO . No Manual range selection is possible. Testing of the polarity of diodes, as well as inspection for short-circuits and circuit interruptions can be carried out in this function. In addition to the display, resistance of less than approx 55 ± 25Ω are indicated with an acoustic signal. An acoustic signal occurs when measuring AC voltage>750V, DC Voltage>1000V, AC/DC mA current>400.0mA, AC/DC current>10.00A. The instrument is switched off automatically, if none of the operating elements have been activated for about 15 minutes. A protective rubber holster with a built-in stand protects the instrument against jolts and falls. It also secures the test probe for one-hand operation, and allows for winding of the measurement cable which provides protection during transport. Low Battery & Over range indication. Display : 3½ digit 2000 counts LCD display. with automatic sign and Function annunciators. Over range indication : Highest digit of (1) or (-1) is displayed. Polarity : Automatic (-)negative polarity indication. battery Voltage drops below the operating Voltage. Measurement rate : 2.5 measurements per second , nominal. Auto Power Off : The meter will shut off automatically about 15 Minutes after power is ON if the meter is not in use. 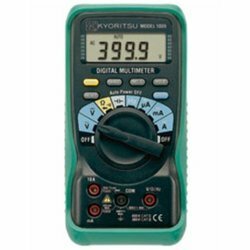 Leveraging on our modern production facility, we trade and supply a broad collection of Digital Multimeters. 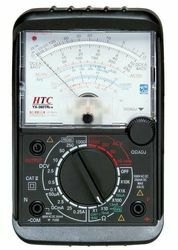 The offered multimeter is designed at our end utilizing top quality material and advanced technology, in adherence with set norms. 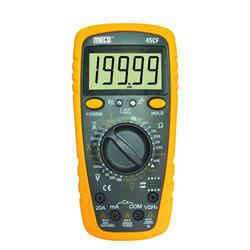 This multimeter is highly demanded among customers owing to its reliable performance. 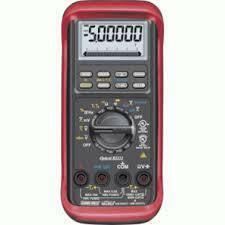 We also offer multimeter in numerous specifications to customers as per their requisites. Weight : Approx 380 grams. 87, but with more problem-solving power, safety, convenience and impact protection. heat resistant silicone test leads and more. reduce risks related to surges and spikes. temperatures of 18 °C to 28 °C, with relative humidity at 0 % to 90 %. 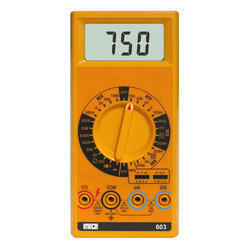 Display: this digital multimeter can display up to 4000 counts. Auto power-off function: it turns off automatically if not in use for 30 minutes to conserve battery life. Auto range and manual range selectors are provided along with the range hold feature. It has diode test feature and capacitance test feature. Backlight LCD is highly visible, even in dark locations. Auto power-off function: it turns off automatically if not in use for 30 min. All ranges of measurements including the resistance measurements are protected against overload voltage of 600V. Measuring prod can be covered for safety by a unique cover mechanism. 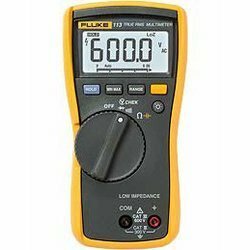 The Fluke 15B digital multimeter has the features needed to find most electrical problems. Simple to use with capacitance and resistance measurements. 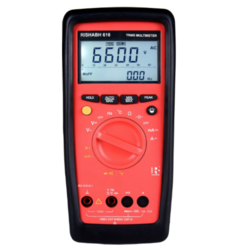 With the help of our state-of-the-art infrastructure unit, we are able to trade and supply superlative quality Analog Multimeter. 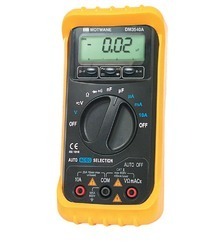 Our multimeter is available from us in numerous specifications to choose from. 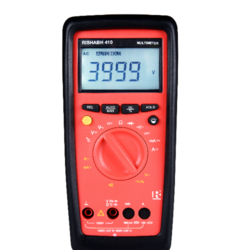 This multimeter is appreciated by our clients due to its optimum quality and durability. 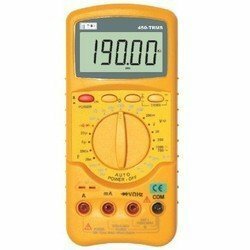 The multimeter offered by us is designed by using top quality of material & leading techniques in accordance with the set norms. Product Net Weight 310g ?? ?Including Holster??? 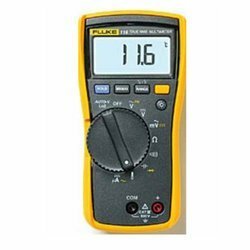 FLUKE 15B & 17B (Economical Series)We manufacture FLUKE 15B & 17B which is an economical series multimeter which can be used to measure various range of current and voltages of both AC and DC, resistance, capacitance and frequencies. Resistance, capacitance, continuity, beeper, diode, ac amps and dc amps with durable holster. 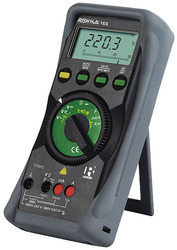 Safely designed for all inputs ranges and functions up to 1000V. Frequency up to 100 KHz, Temperature and Relative mode in 17B model. Safety rated as per IEC/EN 61010-1 2nd Edition. 17B+ offer everything you need. 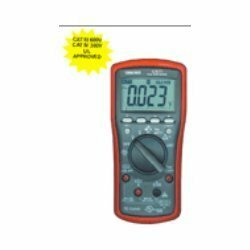 3 4/5 digit 5000 counts digital multimeter with analog bar graph & Rs 232 computer interface. Operating Temperature : 0°C to 40°C,at <70% R.H. Storage Temperature: -20°C to 60°C, <80% R.H.
With battery removed from meter. Record MAX, MIN, MAX-MIN readings. Crest (Instantaneous Peak Hold) MAX, MIN, MAX- MIN readings. 500,000 counts high resolution stable reading mode. dBm readings. High noise rejection filtered Line Level Frequency mode. Line Level Frequency with 4 Trigger Levels. Audible & Visible input warning. 42 Segments Analog Bar graph :60 per second max. Power Supply : Single Alkaline 9V battery. 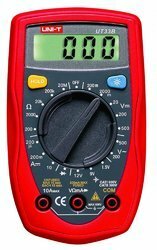 This Multimeter has been designed according to IEC-1010 concerning electronicmeasuring instruments with an overvoltage category CAT II 1000V, CAT III 600Vand Pollution 2. The 5 in 1 Digital Multi-tester has been designed to combine the functions of Sound level Meter, Light Meter, Humidity Meter, Temperature Meter and Digital Multimeter. KM 19 having 14 functions with 39 ranges. Auto Ranging & Manual Ranging. Max. Voltl!ge between terminals & Earth Ground 600V DC or rms AC. In conformity with IEC 1010 CAT 111000V, CAT III 600V. Operating Altitude: 2000 meters (7000ft.) maximum. Overrange Indication: Display "OL," or "-OL". Auto power off: 15 min. Polarity Automatic, positive implied, (-) negative polarity indication. Over range Indication‘OL’ or ‘-OL’ is displayed. 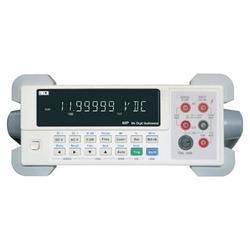 Auto range on Frequency range & measurement up to 2 MHz. Test Leads, Carrying Case, User Manual, Battery.